Matlock Town manager Dave Frecklington. To say Dave Frecklington was disappointed with his Matlock side on Saturday is most probably a huge understatement. He looked to be seething after watching the Gladiators throw away the points in a 2-0 defeat at a limited Grantham side who showed little as an attacking force. “You can never underestimate this league,” Frecklington said. 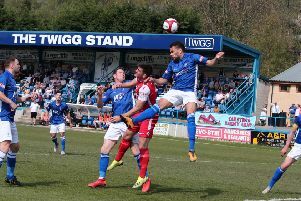 Matlock should not have lost this game, they should have won it comfortably. But as the chances came and went, there was a feeling that those missed opportunities would come back to bite the Gladiators — and so it proved. The new-look Gingerbreads had scarcely managed a shot at goal when, in the 69th minute, Matlock switched off at the back. They had ample opportunity to clear, but didn’t, and as Grantham maintained their assault, Chris Dawson beat Nathan Whitehead far too easily to create space and rifle his firm finish past Ross Durrant. Any hopes of late salvation for the Gladiators evaporated in the last minute. The hosts broke at pace and on loan striker Jordan Adebayo-Smith’s cracking finish from the edge of the box was too strong for Durrant as it nestled in the bottom corner. Matlock only had themselves to blame for the dispiriting defeat. They should have gone in front as early as the sixth minute when Jonny Margetts skilfully found space in the home penalty box, skipping past a couple of tackles, only for Grantham goalkeeper Sam Andrew to brilliantly beat away his shot. Andrew would play a key role in Grantham’s victory and was man of the match. Dwayne Wiley joined the charge to have a couple of shots charged down before Craig Westcarr did well on the right to set up Luke Hinsley, who completely sliced his shot yards wide of the target. Then from a corner played short, Greg Tempest, back in the side after injury, saw Andrew well placed to hold his shot. Tempest would not last much longer though. After being fouled in midfield, he was helped off and replaced by Michael Williams. A quiet spell, apart from Westcarr’s free kick being cleared, brought half-time on an uninspiring afternoon at the South Kesteven Sports Stadium. After a similarly quiet opening to the second period, Matlock increased the tempo with Chris Salt latching on to a Hinsley flick-on for Williams to have a shot well blocked by the Grantham defence. Shortly afterwards another assist from Hinsley after a free kick saw the ball drop for Margetts, but again Andrew produced another excellent save to keep his side level. A deflected Williams strike looked as though it might find the net until Andrew intervened yet again, getting down swiftly to push away the strike. Grantham at last found an attack of note after replacing former Gladiator Adam Smith. Wiley blocked a strike from Sam Cartwright but following up full back Ross Barrows badly overhit his cross from the right with Matlock at sixes and sevens at the back. But then Dawson scored and Grantham, who had showed little urgency and invention as an attacking unit, had something huge to hang on to. Michael Hollingsworth, Westcarr, Salt and Hinsley might have levelled before Adebayo-Smith then killed off the Gladiators, who were found wanting at both ends.